I received a free e-galley of this book from Sourcebooks Fire via NetGalley in exchange for an honest review. It’s difficult for me to summarize my thoughts on this book because I have so many–Lizzie Lovett is indeed an emotional rollercoaster. It’s confusing, unique, and truly keeps the reader guessing. Let me just say that despite the title, The Hundred Lies of Lizzie Lovett is not Lizzie Lovett’s story. It’s Hawthorn’s. It centers around Hawthorn’s journey to find herself whilst also retracing Lizzie’s movements, because sometimes you need to be looking for someone else’s truth in order to find your own. I had a really slow start getting into Lizzie Lovett. With all of the chaos that comes with the second half of the semester at school, I only had maybe 20-30 minutes to read this a night for about three weeks…not a good idea! I started to forget everything that I had read and it made getting back into the story much more difficult. I made a mistake continuously picking up & putting down this book–it requires undivided attention. I was confused at points and sometimes even frustrated because I just didn’t understand why I should care about Hawthorn (after all, she wasn’t the one that went missing). It took me until about halfway through the book to actually GET where the story was going and why I should try a bit harder to understand Hawthorn. Hawthorn makes this story what it is. Without her complexities, the disappearance of Lizzie would be much less interesting (as odd as that seems). The perspective that Sedoti takes is quite unique–the plot isn’t so much centered around the search for Lizzie herself, which actually receives very little page time, but it’s told from Hawthorn’s perspective and addresses her experiences dealing with Lizzie’s disappearance. Because of this twist, I became extra confused–why should readers care about Lizzie’s disappearance at all when the story is obviously focused on Hawthorn? And honestly, why should we care about a 17-year-old high schooler when there is a girl from the same town who is MISSING?! This question threw me off for a bit, because I didn’t understand it. To understand why Hawthorn, a girl who barely even knew Lizzie Lovett, is so crucial in her disappearance is the purpose of The Hundred Lies of Lizzie Lovett. To me, it didn’t click until about halfway through–but once it did, everything about Chelsea Sedoti’s novel made so much more sense to me. You may not realize it, but you have an impact on others. You influence the lives of even those who you speak to only once or only ever see but never really get to know. Perhaps the people who you know the least might even be the ones whose lives you actually make the most difference in. Perspective is everything. Hawthorn and Lizzie weren’t friends, and they were barely even acquaintances (beyond an itty-bitty run-in in the high school locker room), but Lizzie changes Hawthorn’s life. When Lizzie vanishes, Hawthorn becomes obsessed, confused, and altogether different and THAT is the purpose of this book. By investigating the realities of who Lizzie is and where she went, Hawthorn starts to form questions not just about Lizzie, but about herself as well. Hawthorn’s inquiries into Lizzie’s disappearance lead her to the scariest of realizations–who she really is. That is the beauty of Sedoti’s debut work. The Hundred Lies of Lizzie Lovett is an imaginative, nuanced, coming-of-age story. It’s mystery, drama, and young adult fiction all rolled into one heck of a novel. Despite my initial difficulties understanding the book, I found the story to be truly fascinating. The Hundred Lies of Lizzie Lovett: 3.5/5 stars. 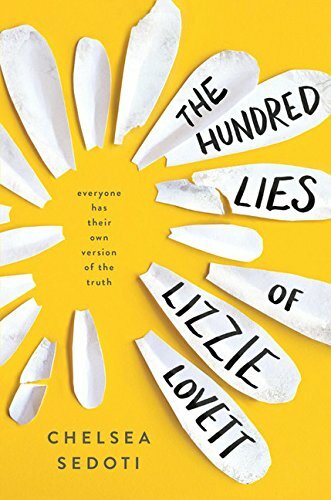 The Hundred Lies of Lizzie Lovett releases on January 3rd and can be found on both Amazon and the Sourcebooks website.